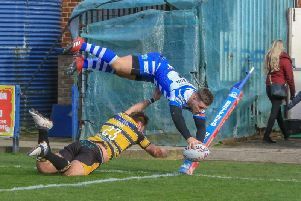 Halifax reclaimed fourth place in the Championship with a Shane Grady-inspired 40-22 win over rivals Batley at the Shay on Sunday night. Playing opposite former Fax back row star Dane Manning, Grady, signed from Dewsbury last winter, was a clear cut man of the match, laying on tries for Brandon Moore and Steve Tyrer and weighing in with some brutal defensive work. Fax are now six points clear of both Batley and Sheffield, beaten by Featherstone, with the hunt for the top four increasingly looking like a five-horse race between Fax, London, Toulouse, Featherstone and leaders Hull KR. “Grady is playing really well,” said Marshall. “He gives us threat on that edge and he never takes a backward step. “I’ll let other people decide whether it’s down to five teams now, there’s a long way to go. “It’s good that we’re in that bracket, around fourth and fifth, but I think we were probably in and around there last year and we didn’t make it, so it doesn’t guarantee anything. “That’s what it’s about and we’ve got an important game at Dewsbury next week. “But I’m happy with where we’re at; we seem to have a winning formula just now. “I thought the first half we were very good. “We scored a couple of long range tries off the back of good defence, which is a good sign for us. “They’re still worth four points, but they’re good scores because they demoralise teams. “But we threw some good ball away in the first 10 minutes of that second half - we had three opportunities - and we need to be more clinical, because some of the teams we are going to be playing will punish us if we’re not. “We can’t rely on our defence if we’re going to concede tries like the Alex Rowe one, where he’s rolling out of a three or four man tackle on the line. Marshall tweaked his team selection, moving former Hull KR utility player Connor Robinson into the halves at the expense of Ben Johnston. “Connor was very good at full back against Whitehaven and didn’t deserve to be dropped,” said Marshall, who was forced into a late change after Ben Heaton, who had been expected to play back row, fell ill.
“Someone has to make way and although Johnno did okay last week, we need some competition in that position. “We needed a long kicking game on both sides of the field as well to take some pressure off Scott Murrell and Connor helped us there. “He’s got a good pass and good skills. “Ben turned up with a virus, so young Martin Reilly came in, which we hadn’t prepared for.